The Mills College 122nd Commencement ceremony was one for the history books, featuring prominent politician Nancy Pelosi as speaker and counting 94-year-old Hazel Soares as part of the 2010 graduating class. It was also the 20th anniversary of a student-led strike that ensured the College remain women-only at the undergraduate level. Pelosi is the first woman elected Speaker of the House of Representatives, while Soares is believed to be the second oldest person to graduate from college in the U.S.
Soares, a San Leandro resident, graduated with a degree in art history and plans to volunteer as a museum docent. Representative Barbara Lee, a Mills alumna and chair of the Congressional Black Caucus, came to the stage to introduce Pelosi. “She is a fierce woman warrior, fierce, and I mean fierce!” Lee said of Pelosi. 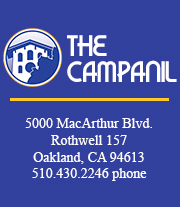 Nancy Pelosi Receives Honorary Degree | Mills College from The Campanil on Youtube. When Pelosi took the podium, she said she thought of Lee as family. “Thank you Mills College for contributing to her success,” she said. Pelosi herself graduated from a women’s college in 1962, the now-coed Trinity University in Washington D.C. The 16-day strike led the Board of Trustees to reverse its decision to admit men to stave off budget concerns. Pelosi also credited motherhood for her success. “When you have five kids in six years and you get them all off to school, you think you can do anything,” she said to laughs from the audience. “And so I did,” Pelosi said. Her message to students was to “be ready” for the possibility that their career path might be unplanned, like she said hers was. “You can do anything and do it differently than anyone who’s done it before because you are different from anyone,” Pelosi told them. Pelosi also made many references to the “success” of the new health care bill, praising the ability for students to stay on their parents’ insurance plans for longer and the benefits to those not pursuing a traditional career path. “If you want to be an artist or a writer you can do that without having to find another job just to get health care,” she said. Before Pelosi spoke, the undergraduate and graduate classes were represented by Sonya Rifkin and Kiala Givehand, respectively, who were voted on by their peers. After Rifkin spoke, Class of 2010 council members presented their class gift: a check of $4,400 to go toward creating an organic campus farm. Kiala Givehand followed with her detailed story of what led her to come to Mills and what she found here. Givehand, who earned her MFA in poetry, said she and her husband uprooted their suburban life in Florida to come to the Bay Area with “two suitcases, two yoga mats, two laptops and no idea where to live or if the city would embrace us.” A former middle and high school teacher, she said she came to Mills because she wanted to be part of a community of women dedicated to change. “I don’t regret it. It was here I learned to be proud to be a woman again,” she said. Kiala Givehand As Graduate Speaker | Mills College from The Campanil on Youtube. “The overall uplifting energy from the guests, from the scene — it showed the school in its best light, literally. It was great to feel Nancy Pelosi’s energy and to know it’s in all of us,” he said.